In the three years of travelling to Ethiopia to treat patients with life-altering facial disfigurements, one case in particular stands out for nurse Lara Tang. A 15-year-old patient who had dropped out of school after being bullied for having a huge tumour on his nose, had travelled hundreds of kilometres to have surgery to remove it. “I remember being there when he looked in the mirror for the first time,” said Ms Tang, a clinical nurse specialist in plastic surgery at St Thomas’ Hospital. Ms Tang, 34, is part of a team of 40 nurses, surgeons, anesthetists and doctors from hospitals around the UK who give up two weeks of their holiday and travel to Ethiopia each year to perform life-changing surgery alongside local medical teams. The complex issues each patient faces makes surgery difficult, but Ms Tang said the biggest challenge is dealing with the limited facilities. “It's not uncommon for us to go day-to-day without there being power cuts or no running water or trying to get a hold of things,” she said. When Ms Tang first travelled to Ethiopia in 2014, she said “nothing could have prepared her” for what she experienced. “The poverty that you see with your own two eyes on the streets, I remember going past on a bus and seeing people lying on the streets - it's quite shocking,” she said. 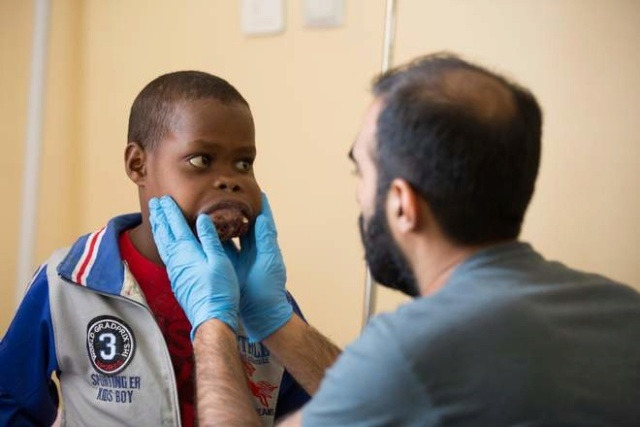 A child is assessed for life changing surgery to correct a disfigurement on his face.